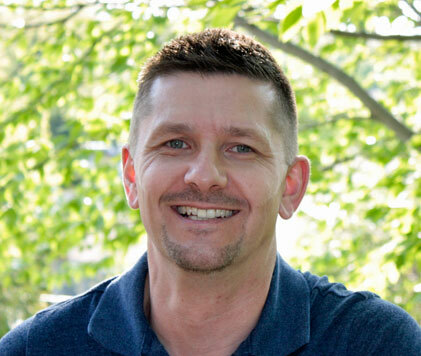 We do not show rental properties or handle the renting of them, however we will post them on our site free of charge as a service. If you are interested please email or call us so we can discuss what we need from you to get you set up in our online database. You've Found It! A Perfect Vacation Place. This 2,800 sq. ft. cottage is a beautiful square timber log structure which houses 2 self contained private sections that are connected by a common (lockable) laundry room. The owner's family occupies the south section and the north section is available to rent. The north section is completely self-contained and private with its own very spacious deck. It is well equipped with all amenities. The cottage is bright and open with large picture windows which offer fantastic views. The interior is finished entirely in wood with high vaulted ceilings and wide plank pine floors. The living, dining and kitchen area is open concept and leads onto the deck. This island property is beautifully landscaped with rock gardens, planters and hanging baskets. There are numerous places to swim both from the dock and along the shore. The island is accessible by water taxi or your own boat and one slip in the boathouse will be made available for your use. Located just a couple minutes by boat from the town docks is this neat little cottage which shares an island with one other cottage. Shallow sandy swimming areas and great sunset views included. 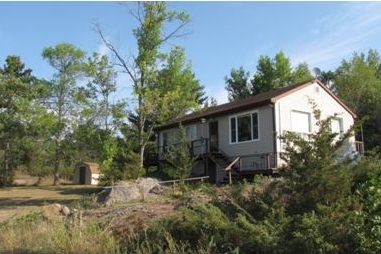 Cozy and warm 2-bedroom cottage with lots of cedar and a unique stone fireplace, on the west side of Little Beausoleil Island for great sunsets. 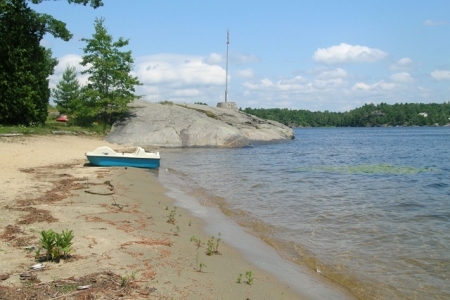 200' of private shoreline, mostly smooth rock & pines...come by taxi boat, in your own boat or rent one from Picnic Island Resort 705-756-2421. We'll rent for July or August, but we'd prefer to rent for a whole month at a time. Very Private With Road Access Too! 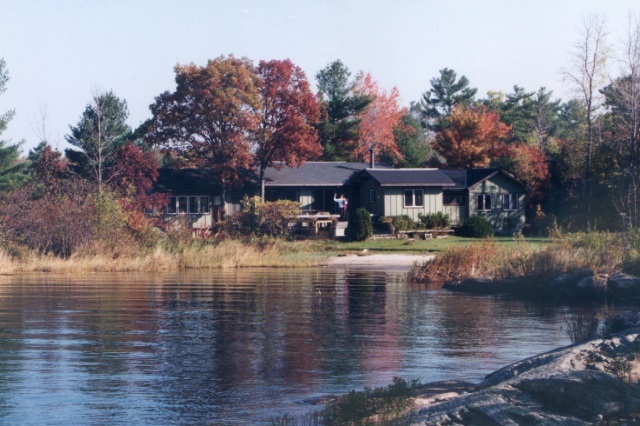 Our 2500 sq foot cottage on 4 acres of waterfront property has 4 bedrooms (suitable for one family of 4 - 6 people), 2 bathrooms, a 400 sq. 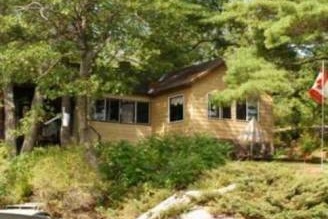 foot Muskoka/family room, with many screened windows, great for sunset gazing or playing games, a living and dining room furnished with pine antiques, the kitchen has a dishwasher, fridge, stove & microwave, and a laundry room with washer & dryer. There are three decks; one sheltered, one facing north, and one facing south. 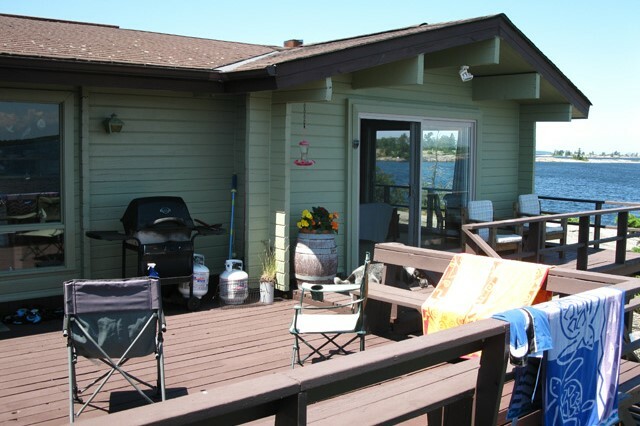 The beach-front deck is the largest, with an outdoor picnic table and BBQ. 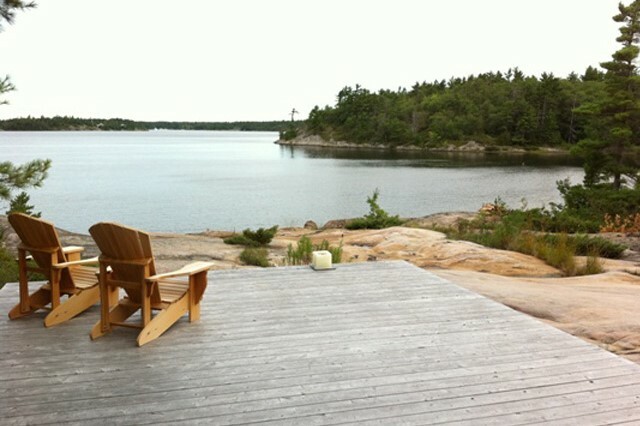 Our dock faces the west so we have two Muskoka chairs on it for those who want to fish or watch the setting sun. There are two private beaches, one smaller, one larger. The larger one has shallow water and is an ideal wading place for children. There is also a swing set for the kiddies. We have a private road leading to our cottage, shared with two other cottages. Two sturdy kayaks are available for your use. Our cottage is 1 1/2 hours from Toronto and 10 minutes by car to Honey Harbour, a small town with a grocery store, liquor store, bakery, library and a few other shops. 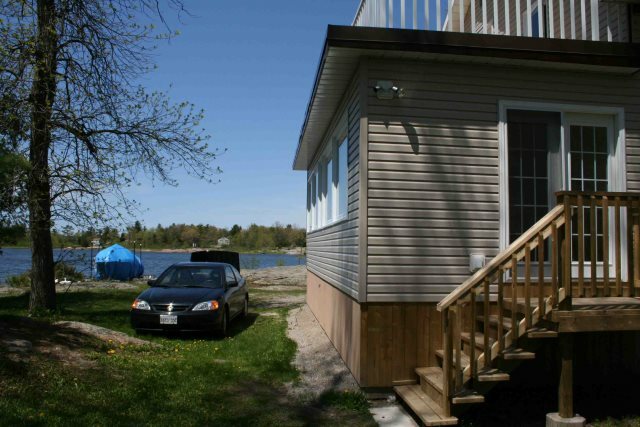 2 bedroom cottage on Maclean lake 20 mins from Orillia and 20 mins from Midland. 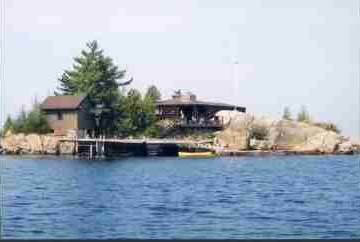 2 docks, good fishing or boating or just relax by a bon fire at night. Just a 10 minute boat ride along protected, inside channels to this lovely pine cottage on Charlie's Channel, near Deer Island, Honey Harbour. 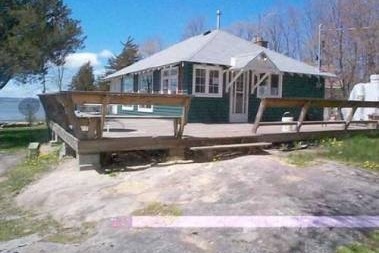 It has three bedrooms, one bathroom, cathedral ceilings with lots of knotty pine, a level child friendly lot that slopes gently to the safe sandy shoreline and lots of deep water for your boats at the huge floating dock. 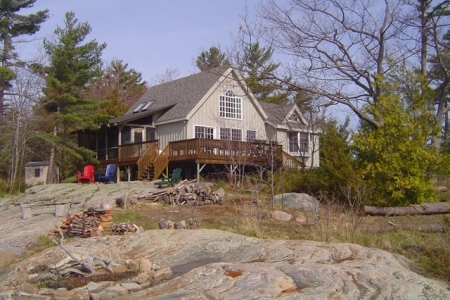 Enjoy spectacular sunset views of Georgian Bay and Cogneshene with this West facing, four bedroom cottage (suitable for one family of 4 - 6 people). 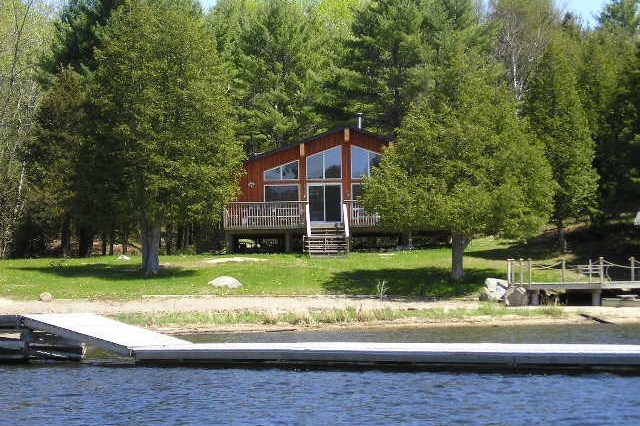 Cottage, dock & septic all new in 2001 with every conceivable amenity; 21' cathedral ceilings, enormous deck (50ft by 18 ft) 1.8 acres with over 1400ft of shoreline to explore. 70 foot L-Shaped deepwater dock perfect for sunning, swimming, fishing and lot's of room for any boat. The cottage is bright and open with large picture windows which offer fantastic views. The living, dining and kitchen area is open concept and leads onto the deck. A four piece bathroom completes the cottage. 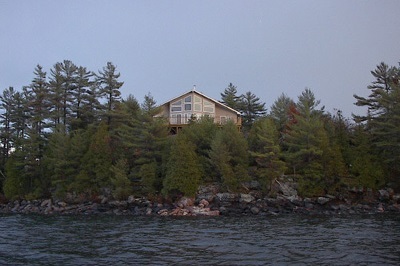 Large older waterfront cottage on Georgian Bay at Macey Bay, near Honey Harbour. Road access just minutes off the 400 on Honey Harbour road. Two story, three bedrooms main floor. Large fully equipped kitchen, large living room with an attached gorgeous three hundred square foot new sunroom looking west with upper balcony. Solid aluminum docks. Hot water, shower. Must supply own linens. Lovely new 2-bedroom cottage with two queen beds, no stove but microwave, hotplate & bar-b-cue, satellite TV, spacious sundeck and small private sandy beach. 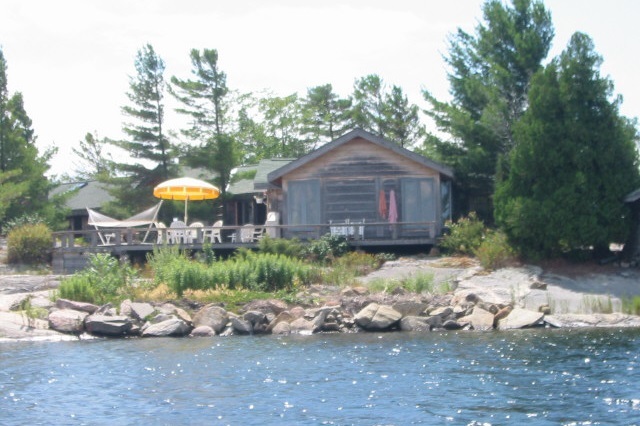 Only a five minute boat ride from the closest marinas to the cottage. 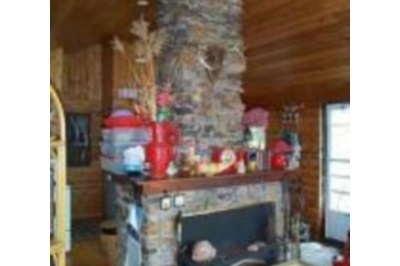 20 minutes from Honey Harbour, this 15 year old post and beam cottage features 3 bedrooms and 2 baths. Bright and open, the large great room (kitchen, living and dining rooms) lead to large deck and screened-in porch. Use of canoe and kayak and lovely walk to beautiful north beach. 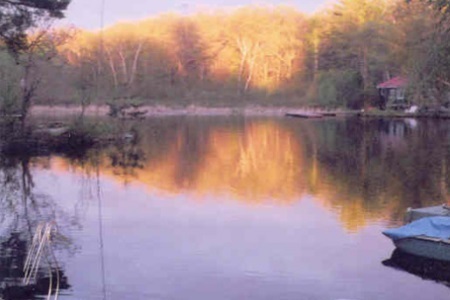 Lots of property for exploring, with terrific swimming/diving rock that includes a slide. Hot outdoor shower and a swing set and tree-house for the young ones. Accessible by water taxi or your own boat. 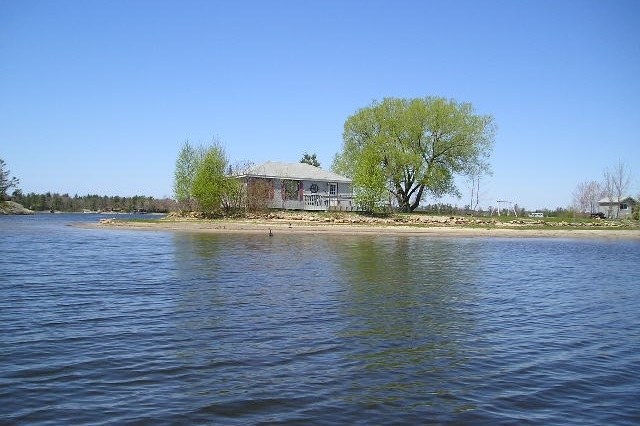 $2,250/week, Minimum 2 week rental (prefer 3) "Weekly rate negotiable, based on length of stay"
Built in 2010, this beautiful waterfront retreat is fully outfitted for a revitalizing retreat. Comfortably furnished, all main rooms look out over the water with beautiful floor to ceiling windows. The main cottage has a fully equipped kitchen, 3 bedrooms, a games room wired for sound, and a backup power generator. 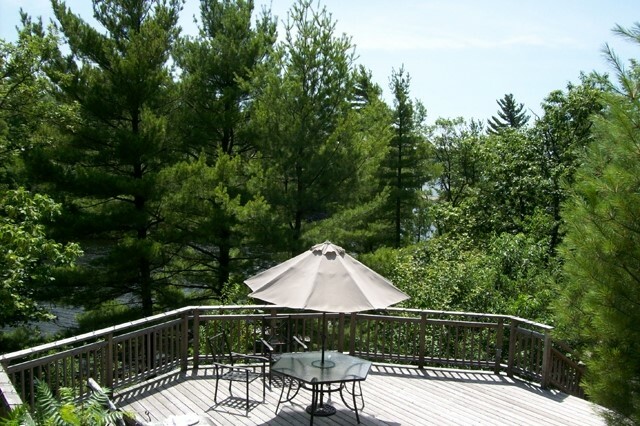 Directly behind the cottage is a pristine private forest for hiking and exploring. Access is by boat to your own private dock. Enjoy the peaceful surroundings of being on your own island with the bustle of Honey Harbour only a few minutes away across the water. A 2 bedroom Bunkie that can sleep up to 8 people can also be booked for additional space.